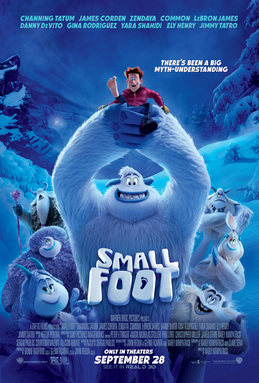 Smallfoot is a 2018 computer-animated musical adventure children’s film about a town of yetis living in high mountains above the clouds, oblivious of the human world until plane crashes and a young yeti, Migo (Channing Tatum) sees a smallfoot (their name for humans). Everything about the yetis’ lives is defined by the laws written on ancient stones worn by their leader the Stonekeeper (Common). Migo is the son of Dorgle the gong-ringer (Danny DeVito) who rings the gong every morning to make the sun rise. Every day is spent with daily labors that don’t have a clear purpose but are prescribed by the stones. Migo and his young friends, including Meechee the Stonekeeper’s daughter (Zendaya), Gwangi (LeBron James), Kolka (Gina Rodriguez), and Fleem (Ely Henry) question the wisdom of the stones.